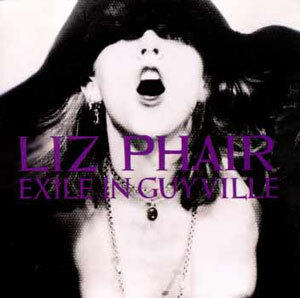 I acquired Exile in Guyville back in high school when it was a hip thing to listen to. It was another of those albums I really needed life experience to understand, though. I didn’t “get it” at all back then and the frankness of a lot of the subject matter made me uncomfortable. When I listened to it again recently I was blown away how good it is, both musically and lyrically. I love how Liz doesn’t really know how to sing “properly”. I think it totally adds to the charm. It’s now an album I frequently play. The album art is classic along the same lines as Electric Ladyland – it looks like a very cool artsy photograph on its own, but then I tried to figure out what’s going on there – is she singing? Is it a sexual position? Based on the content of the album, I’m sure that confusion is intentional. Further adding to the confusion, it’s almost religious in composition – the covered head has Virgin Mary-like connotations. I have seen Liz live, by chance. It was back in 2003 when she was trying to go for a more mainstream sound. She opened for the Flaming Lips at the Warfield and was plagued by horrible sound issues. The crowd was pretty upset for her, and we listened patiently to her new songs, which really were nowhere near the same league as her old ones, though at that point it has been so long since I listened to Exile I barely remembered the old songs. I’m glad I didn’t let that phase me and gave this album a second chance.